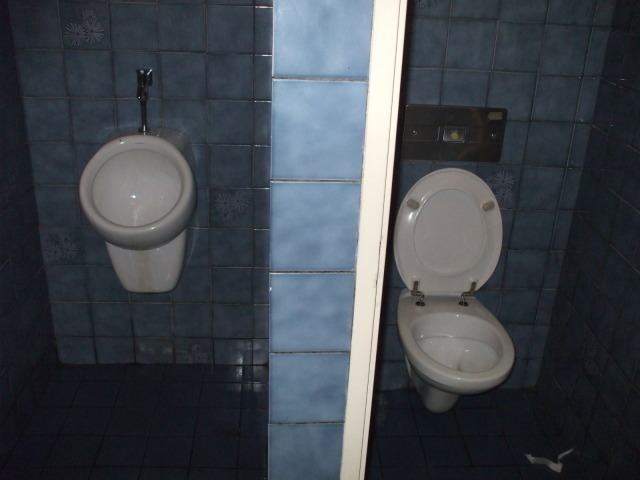 There are some unusual toilets in the Netherlands. 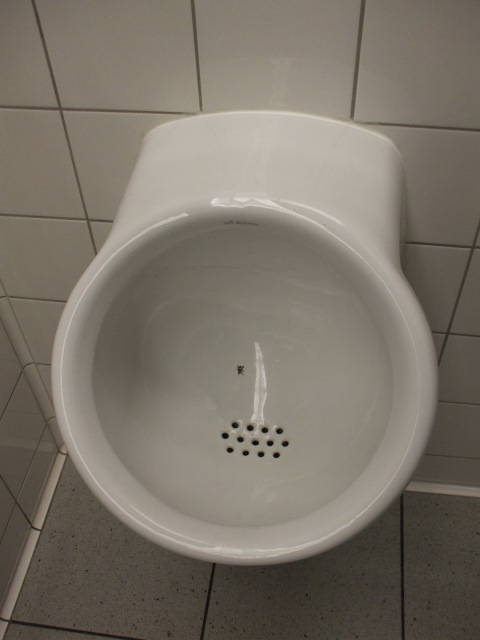 There are the famous "urinal flies" at Amsterdam's Schiphol Airport, glow-in-the-dark toilets at some of the famous Dutch coffeeshops, open-air urinals, and some German "inspection shelf" toilet bowls. 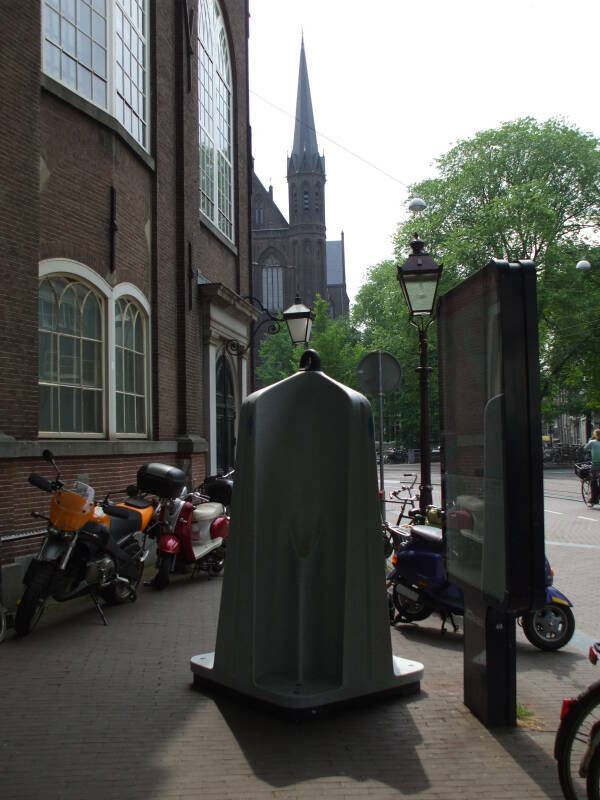 Here is one of the most famous urinals in the world, those at Amsterdam's Schiphol Airport. Someone, possibly a psychologist with an emphasis on urinary studies, determined that aim and therefore cleanliness improve with a target. So all the urinals have a small black fly in the target area. The textbook Consumer Behaviour, Isabelle Szmigin and Maria Piacentini, Oxford Press, 2014, used my picture. This picture almost made it into the Sunday Business Section of the New York Times. I had received an e-mail from the art director of that section asking permission to use it. But he sent the message late on Wednesday, and had panicked by the time I saw the message and replied on Friday morning. The article was "When Humans Need a Nudge Toward Rationality" by Jeff Sommer, in the 7 Feb 2009 issue. 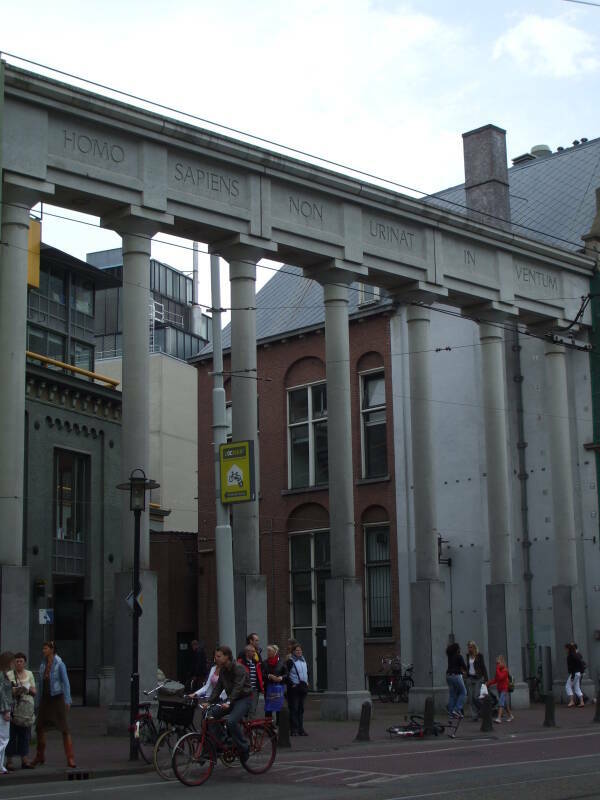 "THE flies in the men's-room urinals of the Amsterdam airport have been enshrined in the academic literature on economics and psychology. 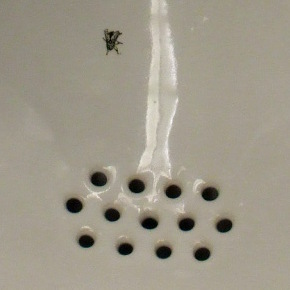 The flies — images of flies, actually — were etched in the porcelain near the urinal drains in an experiment in human behavior. 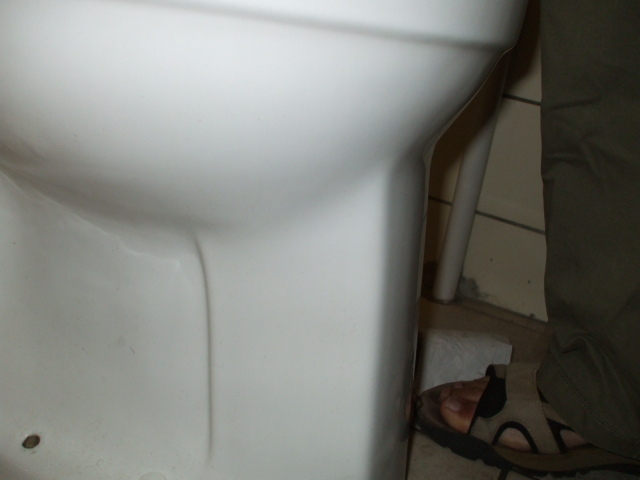 After the flies were added, 'spillage' on the men's-room floor fell by 80 percent. 'Men evidently like to aim at targets,' said Richard Thaler of the University of Chicago, an irreverent pioneer in the increasingly influential field of behavioral economics. Mr. Thaler says the flies are his favorite example of a 'nudge' — a harmless bit of engineering that manages to 'attract people's attention and alter their behavior in a positive way, without actually requiring anyone to do anything at all.'" I've been told that Victorian-era English decorated urinals with pictures of bees. The genus containing most bees is Apis, the honey bee is Apis mellifera. That's quite close to "a piss", hence the pictures of bees. The distinctive raised hemisphere shape is not unique to the special Schiphol design. Here is the toilet facility at the Bulldog bar / cafe / coffeeshop in Amsterdam. In the area of Amersterdam coffeeshop toilets, here is the glow-in-the-dark facility at the Homegrown Fantasy coffeeshop. It's lit entirely by blacklight. Very psychedelic. However, blacklight toilet illumination is generally done to prevent the use of intravenous drugs. You can't see your blood vessels under nothing but ultraviolet or just deep blue lighting. 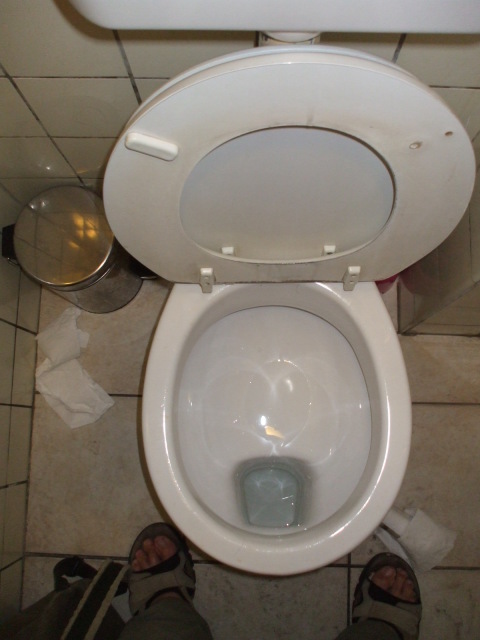 Speaking of illicit drug use, see the blog article You Can Flush But You Can't Hide. It describes several research projects using wastewater-based epidemiology. They can detect which drugs are more commonly used in different cities, and variations in use during the week and in some cases during individual days. The Netherlands is close enough to Germany to get some of their plumbing from there, including this Teutonic Inspection Shelf model at the Sphinx Hotel in Amsterdam. Notice that the inspection shelf is in the rear and the exit is at the front. 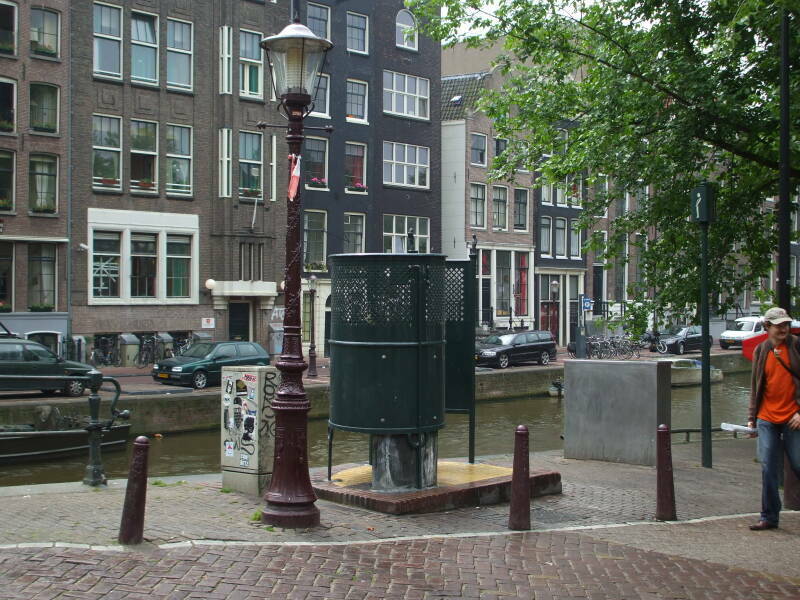 Amsterdam has lots of open-air urinals. In some districts you find them on every corner. 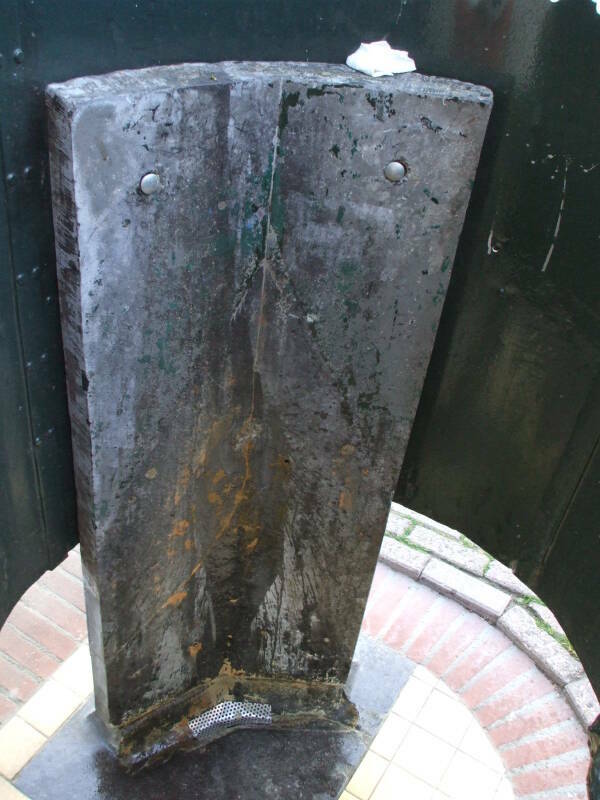 These are the old design: a lead-covered vertical panel enclosed within a spiral steel screen. Then there are the new ones, shown below. They are a plastic pillar type design with a steel hook at the top to move them. And yes, this is all there is to it. It's awfully close to just peeing on a lightpole along the street. "Performance anxiety" can be a problem. Note the blue border, I know what I'm talking about. These examples are portable. 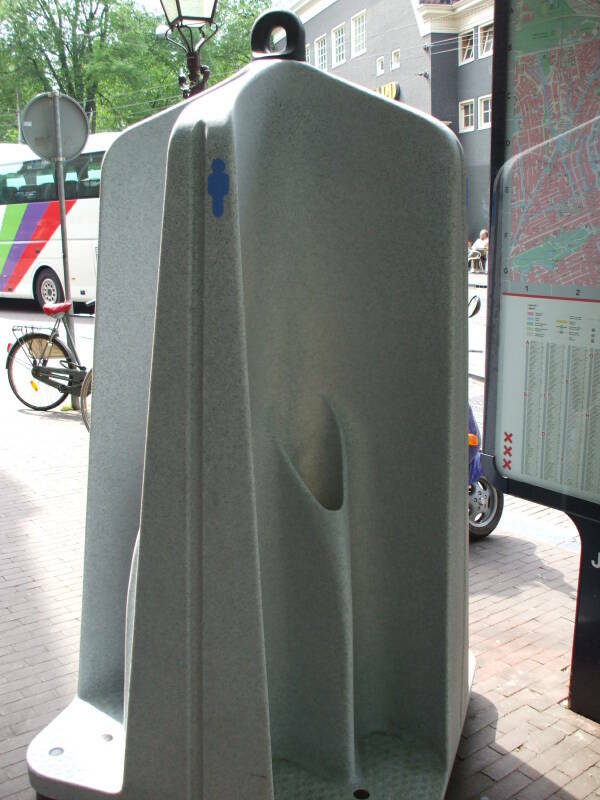 A permanent but part-time public urinal solution has been invented by a Dutch company, the Urilift. They have been installed in a number of locations in Europe, including Denmark and the U.K. 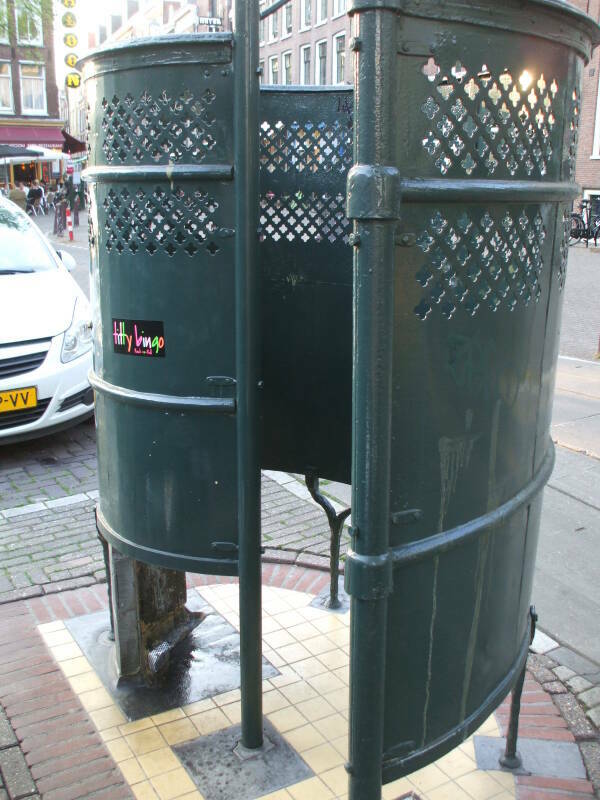 The idea is that you have a cylindrical public urinal, about two meters tall and of a generally cylindrical shape. It is embedded in a sidewalk or the surface of a plaza. By day it is retracted down below the surface, looking like nothing but a manhole cover. At night, either under the control of nearby bar owners or triggered by a timer, it rises up. 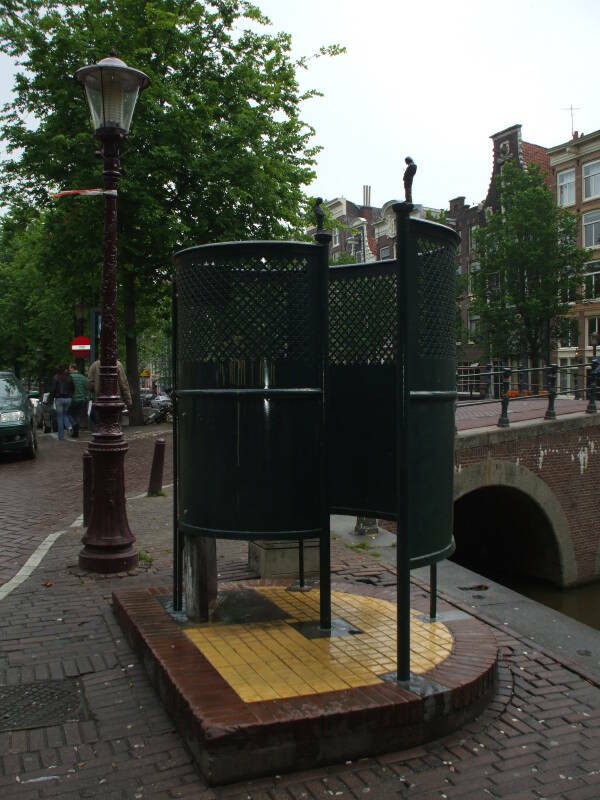 They are installed to greatly reduce the incidence of public urination in areas with lots or bars or around nightclubs. They have been around at least since 2004. You can quote me in full in both instances. I do remember quite specifically that it was widely featured in the professional journals at the time, and that the venom of the architect wasn't only directed at the locals. I guess he toned it down a bit when he was interviewed in later years. will not be able to check this in a library any time soon as I am working in the U.K. right now."